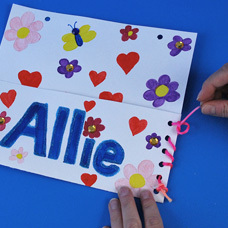 Have each family member or classroom student make their own mailbox to receive cards or mail! Start with a piece of heavy weight card stock or poster board. 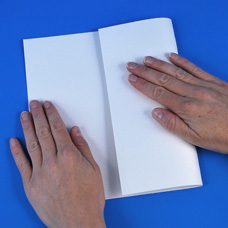 Fold one third of the card stock sheet over towards the center. Lay the folded card stock piece so that the fold is on the left. 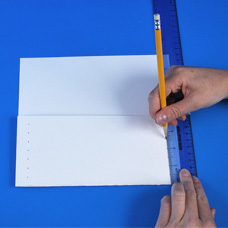 Lay your ruler about ½ inch from the top edge and mark every ½ inch with a pencil. 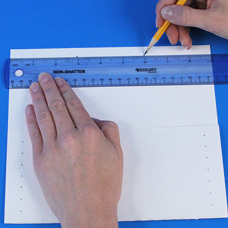 Slide your ruler down to the bottom and repeat the ½ inch marks. You will now need to create the holes for the hanger. Turn your paper so that the holes are on the left and right sides. 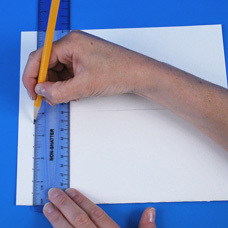 Take your ruler and lay it ½ inch from the top of the pocket. Make two pencil marks that are each 3 inches from the left and right edges. 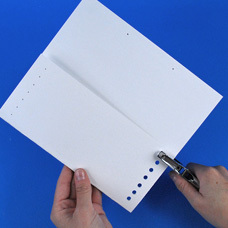 Use your hole punch and punch each pencil mark made on the sides and top of the pocket. Decorate the pocket. Tip: make sure to put the name in the front fold up part of the pocket as shown. 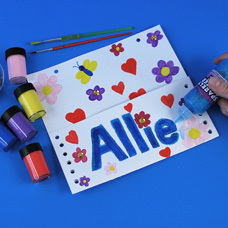 “Allie’s” wall pocket shown here, is decorated with Acrylic Paint, Acrylic Jewels and Glitter Glue. Once you’re done decorating the pocket, you will need to sew up the sides and create the hanger. First, thread a piece of Satin Cord through the bottom hole on the right hand side and tie a knot to secure the shape. Begin lacing the Satin Cord through the holes up the right hand side. Repeat Step 8 to create a knot at the top hole. Repeat Steps 8-9 on the left side holes. Tie a piece of Satin Cord through the top two holes to create a hanger. You have now created a fun wall hanging mail pocket! Here is an alternative version of this wall pocket perfect for a boy! 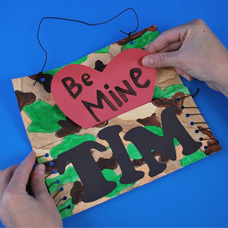 Use Acrylic Paint to create a camouflage look, then cut letters using Alphabet Stencils and use Braiding Cord to lace closed. 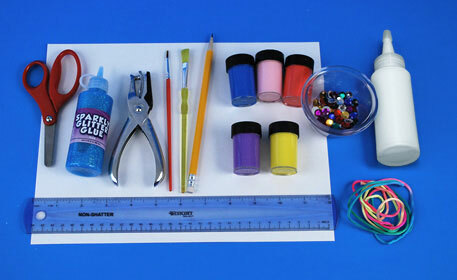 Line up all the pockets on hooks in the classroom or on a cork board in the kitchen. 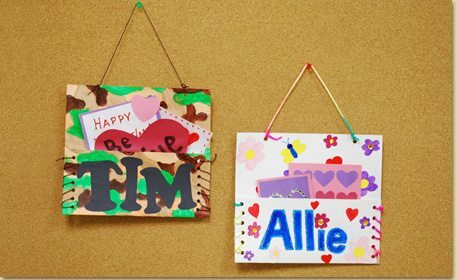 Fill with Valentine’s Cards, birthday wishes or just happy notes! Children will love checking their mail boxes for mail!